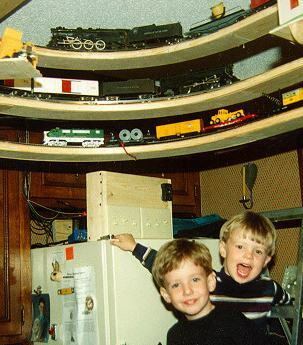 Mike has layers of trains suspended from the ceiling in his kitchen, because he has limited room. Note the small platforms he used to mount his track side accessories so that they can be removed easily without having to dismantle what is on them. Mike ran two 1X4's across the top of the ceiling, attached the four "dog legs" at four points on those 1X4s so that they hold the 1/4s on which the tracks are mounted. That's Mike's American Flyer #322 (see text below). 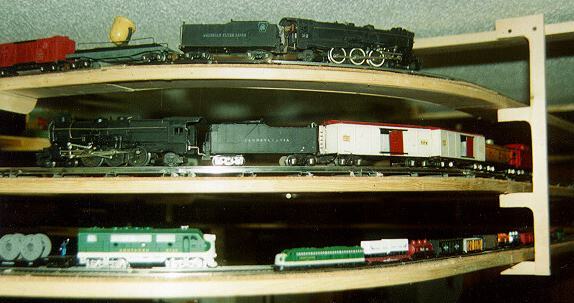 The second level is an 'O' gauge American Flyer which he recently acquired. He also runs HO and N gauge on the third level down. These are the sons of some friends of Mike's who were over to see the trains recently. They seemed to enjoy it. I'm Mike Vandiver, a United Methodist minister in Moncks Corner, S. C. I'm 55 and I got my first train, a Lionel passenger train (green cars) when I was 5 years old. I still have it and it runs great. I got my American Flyer (322, tender, coal car, cattle car, search light car and caboose) when I was six. I did not know at the time that Santa (my father) got it for me with "credits" he got for buying automotive repair tools (he was a mechanic) from a local Firestone store. A year later, I got an Erector set the same way. Methodist ministers get moved from one church to another quite often and we must live in a house (parsonage) provided by the church. I had not had room in any of the parsonages to put up a permanent display. 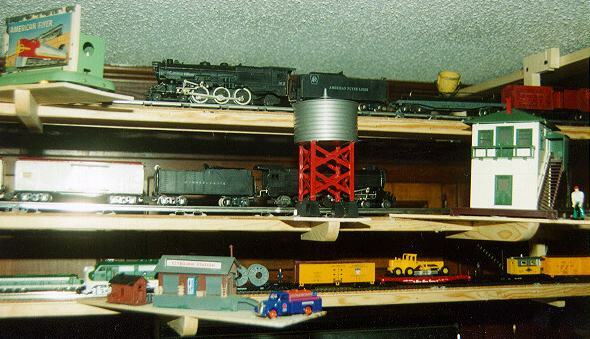 After seeing some trains overhead in some toy stores, I decided to put my overhead and in the hallways of two of our homes. I just got through putting up this three layer display. My first AF is on the top layer. A recently acquired O gauge AF is on the second layer and an HO and N gauge are on the third layer. I also developed a way to attach small accessory platforms to the various layers. I also have a platform built which is on grocery car wheels so that I can take the tracks down from the ceiling, transport them to schools, shows, etc., and put them up for displays. I really don't know a lot about the electrical or mechanical end of this hobby, but I'm learning and I appreciate the patience demonstrated by the folks on the chat line with my questions and comments. Would love to hear your reactions., contact Mike Vandiver.